I started elementary school in 1966 at Westwood Terrace in San Antonio, Texas. While I was there, I heard many local legends. Later I found that anyone who had gone to school in San Antonio had heard of the Donkey Lady. Now the way I heard it, back in the fifties, a young woman had been in a fire. (My wife says she heard the Donkey Lady had lost two children in that fire and that her husband had started it). She was left horribly disfigured. It was said that when her face healed, all the skin had something of a drooped, baggy appearance. Her fingers had all fused together, leaving dark stumps, or hooves. 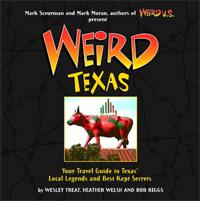 Disfigured and totally insane, she stayed mostly in the rural areas of Bexar (pronounced "bear") County and terrorized anyone who approached her. As children, when we could stay out late on summer nights, we would all describe what we thought she looked like. We were absolutely positive she waited in the darkness for us to separate so she could pounce on a lone victim, ripping and chewing... well you get the idea. Most of the Donkey Lady stories have faded into memory, but one was a little harder to shake. One of best my friends told of a cousin who was with his father and brother on a weekend outing. They were going to camp and do a little fishing in an unofficial county park. The group pulled up to a weed infested area off a dirt road and began to make camp. The two boys had the task of unloading the pickup truck while the father found a suitable spot for the tent. While unloading the truck one of the boys heard a rustling in the weeds just ahead of the truck. He told his brother, who in turn called out to their father to come to the truck. The three of them watched the tall weeds beneath the oaks away from the road bend under the weight of what was apparently a large animal. Then they heard an odd snorting sound and a high-pitched snarl. The father, not recognizing the sounds coming from the "animal," decided they probably ought to find another spot to set up camp. The three of them quickly threw the tent, sleeping bags, and gear into the back of their truck. While packing up, the father watched out of the corner of his eye, as the weeds shook nearby. The prowler moved away from the trees and began heading for the general area of the road. The father urgently whispered for the boys to get in the truck-- fast! All three of them were in the truck in a flash and the father started it up. He put the truck in gear and was just pulling out in the road when something fast and large burst out of the weeds and ran at the front of the truck. Seconds later, a horrible apparition bounded up onto their hood and began shrieking at them through the glass. It was the ugliest thing any of them ever saw. They swore it looked like a donkey, but it was mostly human. It screamed at them more as the truck continued to move away from the weeds and into the road. It used its deformed hands to punch at the windshield and broke it in many places. The father hit the brakes. The thing slid off the hood and onto the dirt road. Throwing the truck into reverse, the father floored the gas pedal and put some distance between them and the thing backing into the weeds off the road. He then put the truck into first and stepped on it again. That thing was coming up on them fast. They said it almost looked like a wild animal with an incredible look of rage and hatred in its eyes. Dirt sprayed up from the road at the beast as they pulled out, slowing it down just enough for them to get away. The Donkey Lady supposedly had finally dropped back and headed into the weeds. After the story was told, and my friend let it be known that he thought it was a nice story but, well, it was a nice story. Then he was taken outside and shown the truck. The windshield was almost knocked out. The hood was dented and its paint was scuffed and scraped. 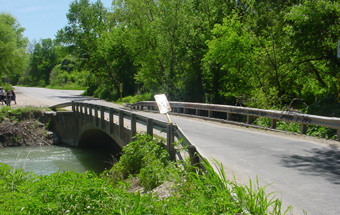 The Donkey Lady Bridge is the bridge that crosses Elm creek via Applewhite Rd., approximately four miles North of Loop 1604 on the South side of San Antonio. The tales that I have on the Donkey Lady are not directly related to me, however they were relayed to me through friends in high school. These are people I have known all my life, and have no reason not to believe them. One night in late 1987, while at my best friend’s house, four fellow companions showed up. Bored and looking for something to do, we suggested they visit the "Donkey Lady Bridge." This locale was only a short drive from the house. They agreed and were soon driving out of sight. About six hours later their vehicle returned to our driveway with only one occupant. Assuming he had taken the girls home and was ready to party in San Antonio, we went out anxious to greet him. What we found at the car was something I'll never forget: the windshield was busted, the front dented, and there was what appeared to be blood all over the hood. We immediately ran to the driver’s door to see if John (not his actual name) was alright. He was just sitting there staring out the windshield with a blank expression on his face. After several minutes of consistent badgering, we finally got him to talk. He told us that he and his friends Lisa, Terri, And Jill had arrived at the bridge. They began to honk their horn and call for the donkey lady (according to legend this is how you are supposed to get her attention). After about fifteen minutes of not seeing anything, they decided to go into the woods and look for her themselves. What happened next was truly unbelievable, and if I hadn't know John all my life and seen the car I would not have believed it myself. While walking in the woods, John said he got the feeling they were being watched. He immediately stopped and told everyone to be quiet. Looking around and evaluating the situation, he discovered in the distance what appeared to be two eyes staring at them. These eyes seemed to be reflecting from the moonlight and were of a color that he said was be indescribable. The girls immediately panicked and began to run back to the car. John was quick to follow, and soon after he turned away there was a horrible scream from the direction of the eyes. He described it as almost being a cry from an intelligent animal. Too afraid to turn around, he picked up his pace as he ran to the car. When he got there the girls were already inside screaming at him to get in and leave. As he was trying to find his keys, he was heard the sounds of what seemed to be a horse running in their direction. Starting the car, he slammed it into gear and put the peddle to the floor. Suddenly, a figure appeared in the road in front of them. Too afraid to stop, John collided with the figure. It hit the hood of the car and rolled over the roof. 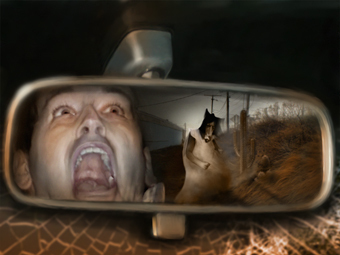 Looking in his rear view mirror, he said he thought the figure got up and continued to pursue them. After hearing this and seeing the condition of the car, my friend and I felt this deserved a second look. John told us that he would never return to that bridge again, but if we wanted to risk our lives, to go right ahead. Grabbing two flashlights and a pair of shotguns (that was the biggest weapon Steve's father had), we jumped in my pickup and made way for the bridge. As we drew closer, we slowed down, and turned on the many off-road lights my truck had. These lit the road and the woods to the side of us as if it were daytime, giving us an outstanding view of the bridge as we approached. The first thing we noticed as the bridge drew close was the large amount of blood on the road. However, this was the only of evidence we could find of the incident described by John. Upon our investigation of the woods on foot, we discovered what seemed to be several tracks of a small horse (unshod) leading to the road. After several hours of looking and not finding anything else, we returned to the house. By this time John had already found his way home, and we laid in bed, too excited to sleep. We decided to drive to Donkey Lady Bridge, partly since we had never been there, partly to give them a good scare. Any child (particularly the south/southeast side ones) that have grown up in San Antonio knows about the Donkey Lady. There was even a phone number you could call to hear her. So they laughed and agreed to the idea. We drove out to the bridge, turning off the headlights before we were actually on it. It is very eerie out there at night; it was much more because of the almost-full moon barely lighting the bridge. Todd started to slowly advance across the bridge, when a figure appeared seemingly from nowhere in the middle of it. He stopped the car and we whispered speculations as to who or what it was. We were NOT expecting to see anything, much less this. Todd placed the car in gear again, and honking his horn, slowly inched his way toward the figure, which promptly vanished. The car was stopped again, and this made us shut up. Todd sat listening to our suggestions to back up or gun the car to the other side when something landed on the hood of the car. Everyone screamed, and Todd slammed the car into reverse and floored it. The dark figure rolled from the hood, and Todd didn't stop until we had reached the main road and made our way to the Denny's on S.W. Military near IH 10. Getting out, we all stared at the hood, which now sported two very deep dents in it. No one had an explanation of just where the figure had dropped from to make those. We went inside to eat, but just decided to call it a night. Todd took his car to a body shop the next day, and had to replace the entire hood--the dents were too deep to pound out.